“Is it really necessary to be that dramatic?” I asked my 9-year old as he held the package of mushrooms at arm’s length while the other hand pinched his nose closed. My whole family claims that they are “allergic” to mushrooms. Typically this wouldn’t be a problem. I get it. Everyone has their likes and dislikes. But mushrooms are my favorite vegetable! Doesn’t that mean that everyone else should like them, too?! You know, as a public service to the lady of the house. Or something like that. As the main cook in the family, I could dice them up into miniscule pieces and slip them into sauces and pilafs. However, that would just lead to dirty looks and conspiratorial whispers. Instead, I do what any rational person would do. I buy mushrooms by the pound and cook them in massive batches, eating them with nothing but a sprinkle of soy sauce and cayenne pepper, preferably when no one else is around to make faces or plug their noses. This recipe was inspired by a Costco-sized portion of mushrooms that sat in my fridge, begging to be used. I ate it as a protein-packed, healthy lunch, but it can easily be served as a vegetarian (actually, vegan) dinner, complete with a green salad. 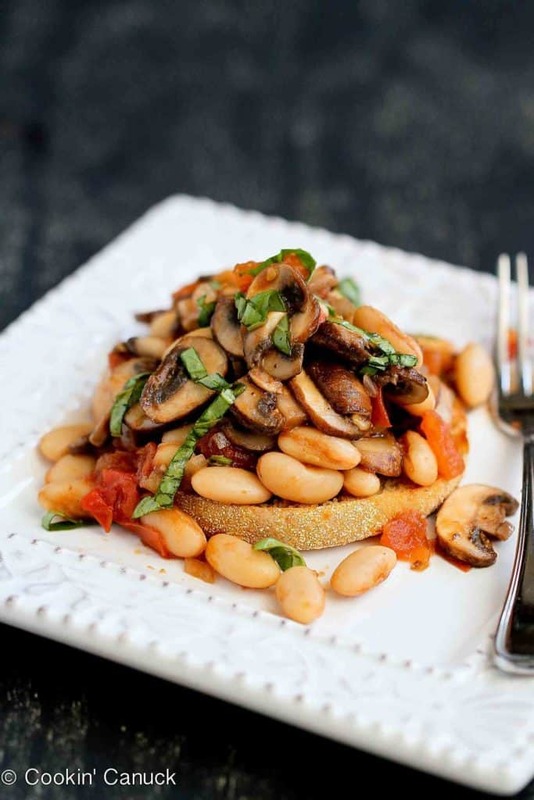 The tender mushroom, tomato and bean ragout, flavored with balsamic vinegar and fresh basil, is ladled over a golden brown, toasted whole wheat English muffin. It’s a knife and fork kind of meal, and satisfies with a good dose of fiber and protein. Heat 1 teaspoon olive oil in a large nonstick skillet set over medium heat. Add the shallots and cook until the shallots are just tender, about 2 minutes. I throw everything into my Everyday Pan (which can go straight from stovetop/oven to table) and let it simmer until done. I truly use this pan at least 4 times per week. 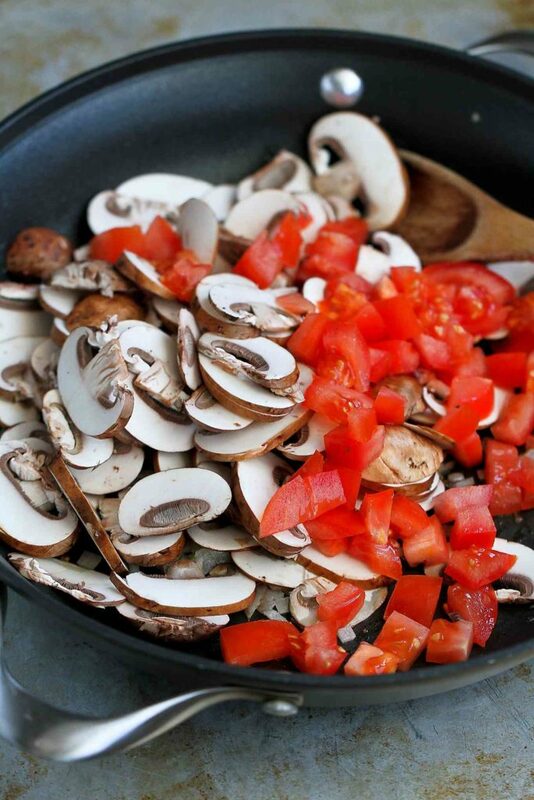 Add the remaining 1 teaspoon olive oil, then stir in the mushrooms and tomatoes. Cook until the vegetables are starting to soften, about 2 minutes. Add the cannellini beans and cook for additional 4 minutes. Stir in the balsamic vinegar, pepper, salt and basil. Toast English muffin halves and transfer to 2 plates. 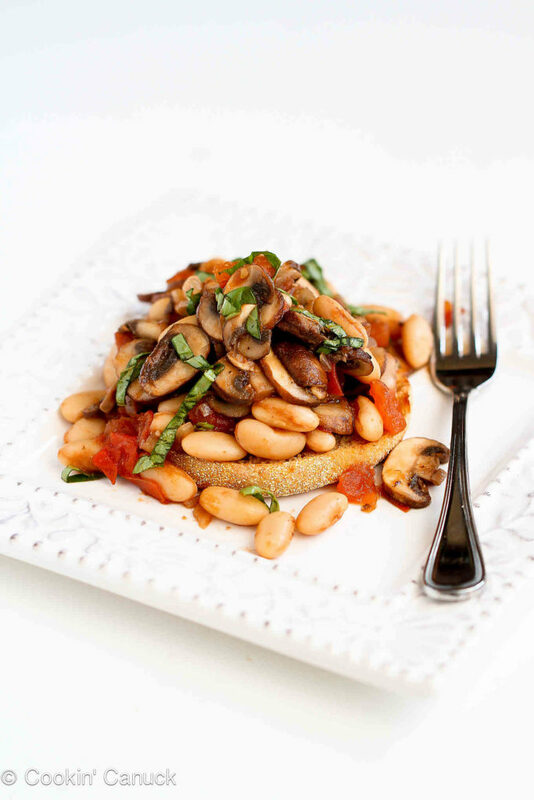 Top each English muffin half with 1 cup of the mushroom ragout. Serve. ***NOTE: Not all English muffins are vegan. Be sure to check the ingredients list. Haha love your sons mushroom reaction! I never used to like ’em either, but now I can’t.stop.eating.mushrooms! 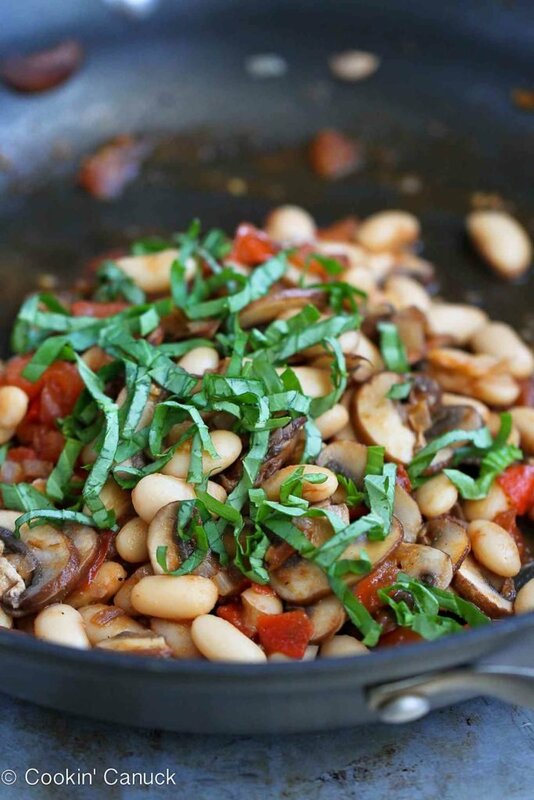 Love the addition of the basil and balsamic vinegar here…this sounds like the perfect, easy meal! Pinned! Thanks, Taylor. I’m hoping that my kids will change their minds as they get older. Fingers crossed! Ha! I’m a big mushroom lover now, but when I was younger I HATED them!! And the reaction of your boys totally makes me think of myself and my mom! Hopefully everyone gets on the mushroom train soon! ’cause this looks delicious! I love mushrooms as well. I don’t know any kid that likes mushrooms, but then they grow up. 🙂 And this recipe sounds wonderfully tasty. I love mushrooms, what a wonderful ragout! 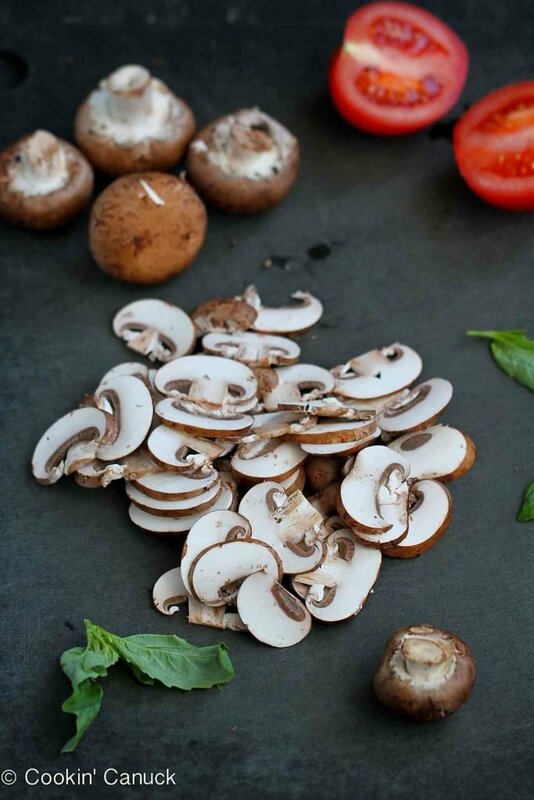 My kids would say the same thing to me, so mushrooms are our date night meals. My spouse and I would love this concoction. Yum, such a perfect combination of ingredients 🙂 can’t wait to try this! My family is the same way. No mushrooms!! It is terrible! This looks so elegant, but so simple and I love that. What a great meal! After all the holiday indulgences, I’ve been craving for vegetarian meals – this is perfect! Happy New Year! I like to fry up a bunch of sliced onions in a tiny bit of olive oil in a non-stick pan. When caramelized, I put them in plastic container(s) and put in the fridge and/or freeze the. What a time saver! 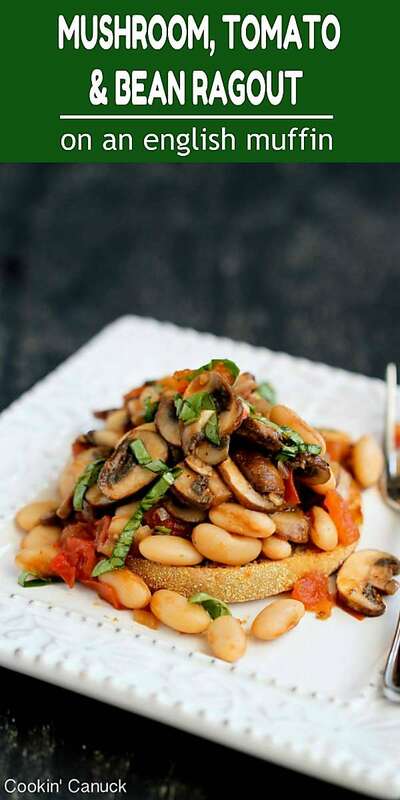 I’m still loving the concept of Meatless Monday and think this would make for the perfect lunch option since my family despise mushrooms as well and I like to enjoy my meals without the looks of disgust. I, too, live in a household that doesn’t like ‘shrooms. I have to sneak them into the house and eat them before anyone notices. This ragout looks amazing.